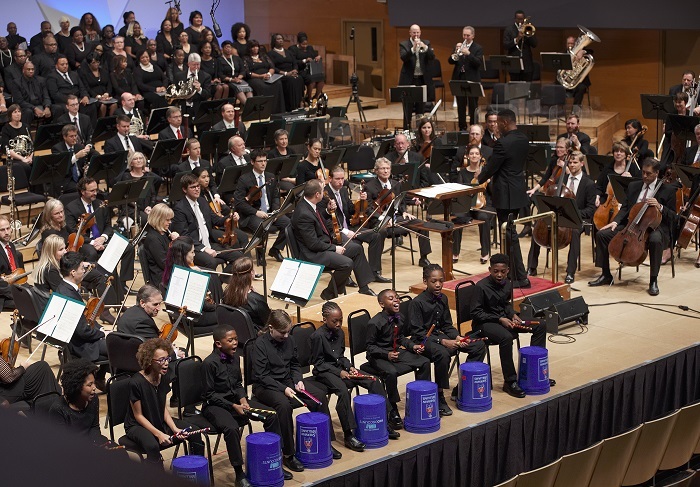 Minnesota Orchestra is spending the week in North Minneapolis through Jan. 27, 2019. The week is part of their Common Chords program, which in the past, meant the Orchestra would spend a week in a town outside the Twin Cities metro. This year, they decided to stay close to home, bringing two full-orchestra concerts to the North side and about two dozen other performances by chamber groups. The Orchestra’s Vice President, Beth Kellar-Long, joined the Morning Show to talk about the week full of events. Saturday night, the full orchestra performs at North High School, led by Osmo Vänskä. That concert features The Steeles, the MacPhail Northside Youth Orchestra, trumpeter Charles Lazarus and Patricio DeLara from Juxtaposition Arts. That performance is free to residents of North Minneapolis. Check here for a full schedule of events. Originally aired Jan. 22, 2019 on the Morning Show with Emily Reese.